In reading the latest Righthaven article, R-J is being accused of using entrapment and ambush tactics because it encourages people to disseminate its articles through its share icons. The claim is there is an “implied license” when R-J encourages the sharing of its newspaper articles. Further, a Righthaven judge stated the argument has merits. As I have frequently said, I am not normally a fan of conspiracy theories. However, when there is an abundance of evidence that images on multiple websites are being labeled “FREE wallpapers”, a strong argument can be made that there is a scheme by the photographers to intentionally trick or trip up users to using the images and later nailing them with a copyright infringement claim. I do not believe that Hawaiian Art Network actually tells or encourages their photographers to do this but I do think they do turn a blind eye to it. If I were to argue on the defense, I would point out to HAN they have a responsibility to at least investigate this when brought to their attention and that they hinge their case on a technicality. The “spirit” of free wallpapers is supposedly to share their work and actually use it on their computers. But when that same image is placed on a website, that is where the “gotcha” comes from. I believe it puts HAN on very dangerous ground relying on such a technicality. The Righthaven lawsuits have shown that judges have a low tolerance for such underhanded tactics and they clearly have voiced this in several rulings. I found this while searching for Hawaii Photographer, Vincent K. Tylor and was thankful to see this is being published. I can tell you that we have been dealing with a situation with this photographer and have learned a whole lot. We received a demand from Vincent Tylor and his attorney for using this image called Lanikai Girl that was found on a website offering free images for download. 3 weeks later I met 2 other people at a business meeting who were sitting at our table who ALSO received the same demand for money for the SAME image. And 1 person who received and paid a lot of money to the same lawyer but for a different photographer named Tomas Del Amo. We all sat shared our stories and here is what we discovered. One of the people there had found info onlne about people out there providing their photos to these wallpaper sites on purpose so they can sue people for using them. One of the woman called the lawyer and photographer to get more info and asked them why they weren’t going after the websites distributing the photos but going after the little guys. The lawyer (JS Street) said they have tried to remove these images but have not been successful yet and the sites were out of country and that it was too late because they were already shared all over the web. He also said the sites were peer to peer therefore they couldn’t control it anyway. It sounded reasonable. So I looked to see where this image was, and contacted all 5 of the websites with this image. Only one was foreign. And none of them were peer to peer, they were all sites where you submit your imagery in big files suitable for wallpaper. All the rest of the sites were in the US where they are bound my copyright laws that were clearly marked on their website, and told us they would have to remove the image immediately if they received a DMCA takedown or their host would shut their website down. One of the websites in Georgia, only accepts images with proof of ownership. The others have a confirmation process so you confirm who you are. One site owner pointed out that only the owners have file sizes large enough to submit (unless they offer stock imagery) so to check if they offer these file sizes for sale and if not, then he must be the one sharing. Another very interesting thing we learned is that Google will help out in these cases, even for foreign sites. This image that Vincent is suing for shows up high in google searches in a very large size. A copyright attorney told us that all they would have had to do is file a report with google and google will remove it from the searches immediately and will take the distributing sites off google searches too. People holding valid copyrights have a lot of power. Lastly, the lawyer pointed out that the photographers website does not have adequate protection, no copyright notices on each page, no disabled right click, watermarks, etc. All the things that most photographers do to protect their images. SO in other words, lots of red flags here. This shows that they guy provided his image to wallpaper sites, has not taken the normal steps to remove the image from the source, has not protected his own sources and whose lawyer is generating letters very much like the GETTY letters you discuss here where they assume you are guilty, make it sound like you can get sued for $100,000 and are asking for the same high amount regardless of how the image was used or if the infringement was intentional or innocent. We all feel strongly that this situation is a little too shady and we are prepared to go to court and let a judge decide. I don’t condone copyright infringement but this seems like a set up and we feel we have adequate enough proof to defend that statement. Somehow, I missed this comment but thanks for sharing this story. It is quite interesting and for the rest of us to keep in mind. We will continue to report on new information as it is submitted to us. 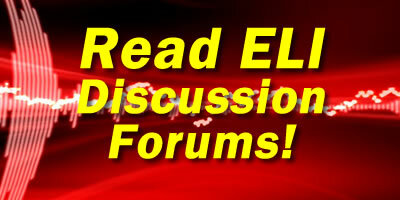 Check back with the ELI website and ELI Forums periodically.